Will this be your first year hosting Thanksgiving? (Or do you remember the first time you did?) I was in college the first time I hosted. My brother, who was in the Marines at the time, was unable to come home for the holiday so instead of celebrating without him at home, my parents came down to Washington, DC (where I went to school) for a low-key Thanksgiving in my tiny studio apartment. I remember prepping for days and cooking WAY too much food for just three people. (Seriously--I think I made a 22-pound turkey, which is way too much turkey.) It was all delicious, but I could definitely have used a bit more guidance to keep things streamlined and less stressful. That's why I pulled together this post to help share hosting tips and advice for first-time Thanksgiving hosts (although these tips will work for everyone, too!). Hosting does not mean you have to do all of the work yourself. Write out a list of tasks and dishes, then look over them to see which ones you absolutely want to take care of, then recruit family and friends to handle the rest. Use an online planning tool help coordinate dishes and tasks. Google the phrase "potluck planning tools" for a bunch of options--or check your phone's app store for mobile versions. At the very least, using a shared spreadsheet that guests can add to or update as needed will help you all stay organized and on the same page. It's also a handy way to keep track of information like travel dates for out of town guests, and any food allergies or dietary restrictions. Hosting also does not mean that everything has to be homemade! Look into prepared options that can make your day easier--grocery stores, restaurants, and bakeries often offer incredible prepared entrees, sides, and desserts that you can order in advance to pair with your homemade dishes. Or pick up a few dips for guests to snack on when they arrive. I even have a few friends that get breakfast delivered the day of so that they don't have to cook multiple meals that day. They say the kitchen is the heart of the home, and this is especially true during Thanksgiving when guests tend to gather right by the food source. As lovely as it can be, this can also be stressful when you're just trying to get those last-minute tasks finished. Try setting up a separate entertaining section in a different part of the house with self-serve snacks and drinks (maybe even a signature cocktail!) that guests can enjoy while you finish up. 4. Do as Much as You Can in Advance. There are a few things that you really can't do until the day of (like that turkey! ), but there are also plenty of Thanksgiving tasks that can be taken care of in advance. A few things that can definitely be done days ahead include chopping and prepping produce, baking desserts or making things like pie crusts and cookie dough, making fresh cranberry sauce or relish, setting the table, picking out serving dishes (and giving them a wash if they've been in storage all year), and stocking up on containers to pack up leftovers. I recently met a woman who likes to set her table as much as a week in advance! That may be a bit excessive (and not really possible for you if you have a smaller home), but I love the idea that you can never get ready too early. All the gorgeous decor items at stores can be tempting, but there is no need to spend extra money on items you're just going to use once. Think about ways you can repurpose items already available in your home (or even backyard!). Fresh pine cones, twigs, or gorgeous fall leaves can be used to create centerpieces. 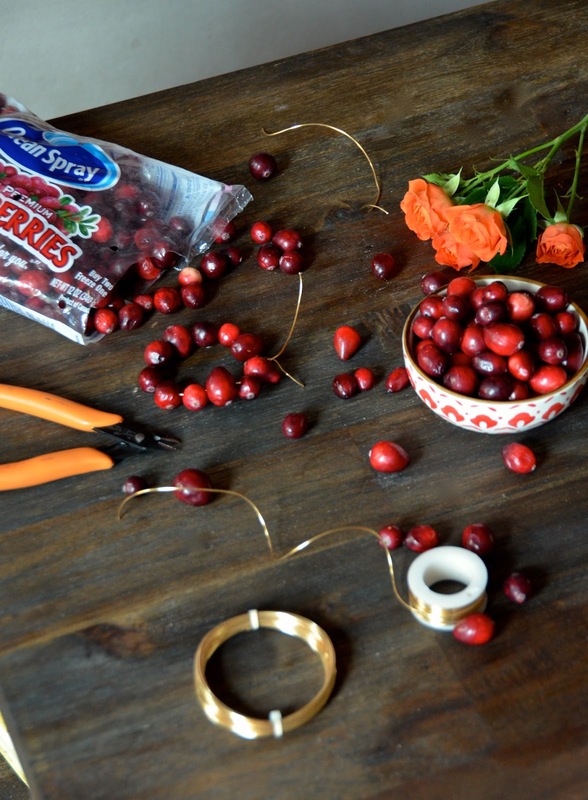 Or use items from the grocery store--fresh cranberries strung together with copper wire make easy and beautiful napkin rings, or feature them in the base of a vase filled with flowers or candles. This one is my personal tip for Thanksgiving and every entertaining occasion. Plan to save a little time for yourself to slow down, get ready, and do what you need to do to feel relaxed and confident. I always pick a hard stop time about 90 minutes before guests arrive when I drop whatever I'm doing (no matter what's still undone! ), and go shower, do my hair and make-up, get dressed, etc. I make sure that I look and feel good, and then get back to finishing up whatever needs to be done. As the host, it's important that you feel good and confident so that you can make your guests feel good, too. And finally, this might sound a little cheesy, but it's really the truest thing. We put a lot of emphasis on making the meal "perfect," but in reality, all that means is that you and your loved ones enjoy the time together. Don't get so caught up chasing perfection that you miss the opportunity to enjoy the moment and the people in your life. Breathe, give things, eat, enjoy, and laugh together. The food is important, but the people are what really matter. I hope you find these tips helpful! I'd love to hear about any tips or ideas you use to make entertaining a little easier on Thanksgiving (or anytime of year! ).